A team from Aberdeen chartered accountancy practice Meston Reid & Co is hoping to raise more than £1,000 for charity. Staff – 11 in total – will take part in the Aberdeen Tower Abseil Challenge on Sunday, March 24. Funds raised will go to specialist charity Spina Bifida Hydrocephalus Scotland (SBH Scotland), who are organising the event. Safety advisors will be on hand to help participants negotiate the 131ft descent from the Northern Lights Tower at the AECC. SBH Scotland, formerly known as the Scottish Spina Bifida Association, supports those with the life-long, complex disabilities of spina bifida and hydrocephalus in Scotland. 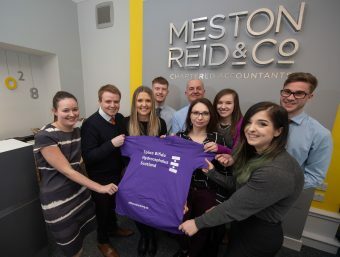 The Meston Reid & Co staff taking part are Claire Blaikie, Laura Aitken, Mark Brown, Kyle Gordon, Nathan Taylor, Amy Robertson, Nicole Third, Zaneta Resiak, Michael Norrie, Steven McAllister and Hayley Brownlie.